All 200 seats were taken when Brian Kobilka (Nobel Prize in Chemistry 2012) started his lecture about G protein coupled receptors (GPCRs) in the historical atmosphere of the Leibinz-Saal at the Berlin-Brandenburg Academy of Sciences and Humanities on 11th of July. 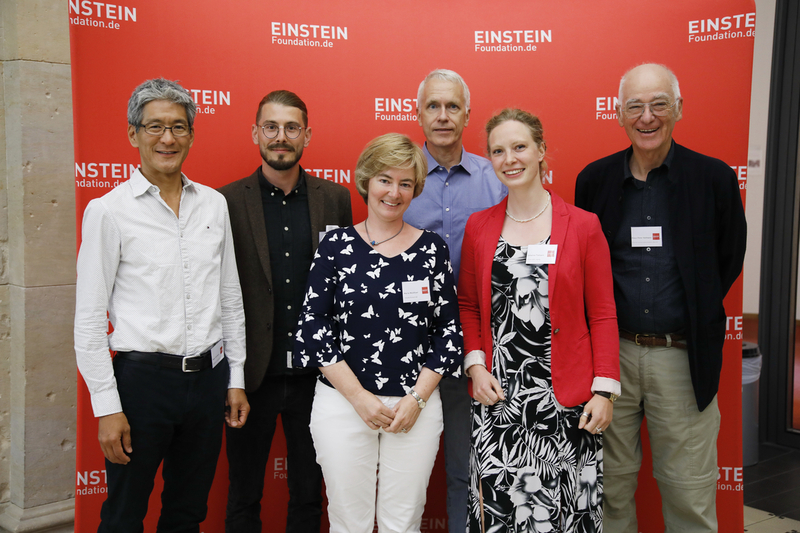 The conference was opened by Prof. Peter Hildebrand, Prof. Ursula-Friederike Habenicht from the Einstein Foundation’s Executive Board spoke words of welcome and introduced the Einstein Foundation and its programmes. The event served as the kick-off meeting of the “Early Career Scientist Forum on GPCR signal Transduction”, organised by Charité – Universitätsmedizin Berlin. Therefore, many young scientists, but also members of the Berlin public, took the opportunity to listen to Kobilka’s newest insights into GPCR signaling and potential medical applications. So, what is GPCR signaling all about? G protein coupled receptors conduct the majority of transmembrane responses to hormones and neurotransmitters, and mediate the senses of sight, smell and taste. Approximately half of all medications used today make use of this kind of receptors. Kobilka, who holds a professorship for Medicine and Molecular and Cellular Physiology at Stanford University, California, has been awarded an Einstein BIH Visiting Fellowship funded by Stiftung Charité in 2017. His research group at the Berlin Institute of Health (BIH) collaborates with the laboratory of Peter Hildebrand from the Charité-Universitätsmedizin at the Einstein Center Digital Future. Jointly with his research colleague Roger Sunahara, Professor of Pharmacology at the University of California San Diego, Kobilka emphasised the fact that collaborations are a key factor for scientific progress. Sunahara, who has been working together with Kobilka over years and is an expert on GPCR structures and functions himself, said he considers himself very fortunate to conduct research with Kobilka of whom he not only thinks as an outstanding researcher, but also a very good friend. The Einstein Foundation is very grateful for this exceedingly successful and interesting lecture and the inspiring discussions and looks forward to new insight in the field of G protein coupled receptors. The Einstein BIH Visiting Fellowship aims to enhance the international profile of the Berlin Institute of Health by involving leading scientists from abroad in long-term academic research collaborations. The Stiftung Charité generously funds the programme. Please click here for an audio recording of the event.